of an open RFID infrastructure. art project exploring our emotional memory of things. People do not realize they are leaving a growing amount of tracks because of digitalisation. Phone calls are being stored and internet traffic is being logged. Radio Frequency Identification tags are small chips without batteries that wirelessly broadcast their identity. 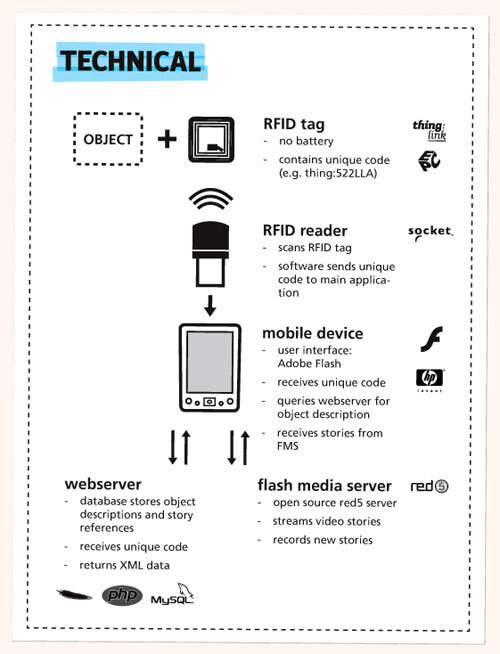 RFID is the next step in history collection. A global infrastructure is created for companies throughout the supply chain. The goal is to apply an RFID tag to every product as an alternative to barcodes. It allows business to store information about objects from the time of manufacture to time of sale (and beyond!) and share that information. In our analog world, objects create history as well! Some are used intensively and might build very strong relationships with people. Objects collect human emotions and experiences, but because these emotions are invisible to strangers the objects seem worthless to them. The project aims to reveal the invisible emotions in things. People are stimulated to look at objects differently. An object?s appearance may give hints, but an object cannot tell us about its collected emotions. Its users can. We can store their stories in the object itself thanks to RFID. People tell about their emotions associated to an object. The project reveals interesting stories about seemingly worthless objects. A parallel is created between the descriptive history collected by business and the emotional history from our analog world. Future mobile devices allow us to explore the digital layer over objects by simply touching them. Information can be retrieved and we can contribute information based on our interests. This project is a small example of this future social internet for things. Read about the project realization in the project blog.